to andy.rhodes, me, bae146, contact, policing.minis., telegraphedito. 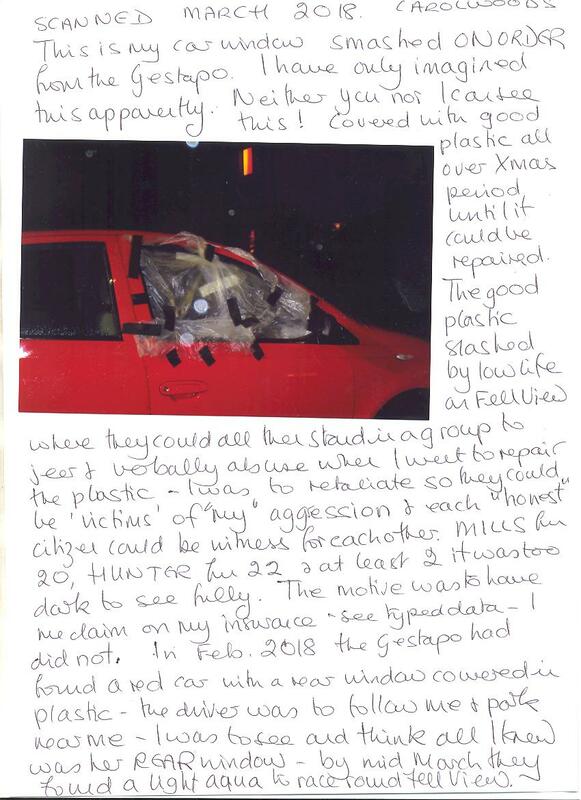 I Ms Carol Woods sent out the photo and related data of the window of my car smashed which was done to force me to claim on my car insurance so that I did not have a full no claims bonus which I have – maximum. The Gestapo actually gave me a crime number "for your insurance company" which I puzzled over; why were they "helpful"? They had declined to take a statement from me, and claim they ignore me when I report serious crime as I am "anti police", yet here they were, "helpful". NO, it was to aid and abet JUNE WILLIAMS in 30 Fell View who they have given ID to as if she is me and her husband Mr CARL WOODS. She was to go and stand about in Lancaster and PRETEND as "seen" that she was me claiming on my insurance. Aside from the yob pestering and following me about, I went to develop a photo and had a seedy, deranged former friend JANE UPTON following me. She worked for LCC as a social worker; she is clearly still used. Jane has to dye her grey hair ginger to be me when she has managed again to dye it almost orange. She always acts out a farce showing she is in need of psychiatric help and today? She was to follow me into Max Speilman and switch on her phone, say “Hi, Carol” then walk out and that is somehow she is me or she was using a phone in response to one I do not have. The staff made comments; I was not the only one to see what she was doing. On Saturday this took place: all harassment and INTENT to manufacture as fact that I met with fraudsters failed and I drove into Morecambe to walk along the prom in the sun. A male waited and he took a photo of what I would see walking where I was; that was PROOF his phone/camera was MY USE. I took a photo, of the same scene, he happened to be on my photo taking his. (I am used to this routine so always ready for these halfwits). End of Morecambe stone jetty (the male ran away after taking the photo and took his phone with him which was a clue it was not mine), a woman waited and she did the same as did I. Her phone was not mine. On the prom then going to a venue at least 2 males stood about waiting and who felt the urge to take a photo which would be the view I had so, I took photos and they are seen running away with their phones which seems to be another clue that they were not me. By 10 10pm I had a male sat in his 4 wheel drive near my parked car (the ILLEGAL GPS allows for all this) and he sends a text to the next in line to pretend I need a lift as I apparently do not have my car. I go walkabout and he drives off: another silly troll is used and then eventually I arrive back at 28 Fell View (approx 11pm). Waiting to see who the Gestapo was to send, they sent the drug dealer* in NY54 RXJ round to pretend she had been the one to drive me back AFTER RECEIVING A TEXT FROM ME. She has close links to 20 Fell View LA2 9RP where I apparently “lived” in a squalid caravan dumped on the frontage by the Gestapo and council to aid and abet that FRAUD for unemployed K MILLS who was used to claim to be my aunt and carer and driver of me. The sister of K MILLS is in 7 Leslie Ave off Fell View and that too is used often as I also apparently lived there as well, I drove round to see if NY54 driver was pretending to drop me at that council house, no. She had driven all the way to Caton and pretended and someone funds that. But the Gestapo then contacted a male from the area and he was to RUN BEHIND MY CAR WITH HIS PHONE ON AND THAT WAS PROOF HE WAS ME IN MY CAR USING A PHONE. He was gasping when I parked up so I drove round again to see if he was prostrate on the ground somewhere or if anyone else wanted to act like an idiot: by then it was 11 30pm and quiet. *The Gestapo prefer to use druggies and dealers in exchange for not prosecuting and someone funds the use of cars and petrol costs. This one arrived at Xmas 2017 never been to 20 before and calls at least 4 times day (not every day) and stays for 5 minutes, no longer. She does the same at the sister’s house on Leslie Ave and the same at 21 Fell View ANOTHER harasser involved in fraud a Mr M Dane, and she also uses 17 Fell View JOANNE NOLAN who is apparently my daughter and I also live there as well. The troll in NY54 is so large she almost fills the car, a Renault Clio or that type. And thus ALL those idiots in the short space of time with JANE UPTON of Lancaster used again and that is PROOF I use a phone. Then the thieves from 41 JARVIS caught hiding under my front room window on 22 March 2018 late at night, he using his phone then sneaking back to 41 to pretend as he was under my window somehow that phone was mine or my use. 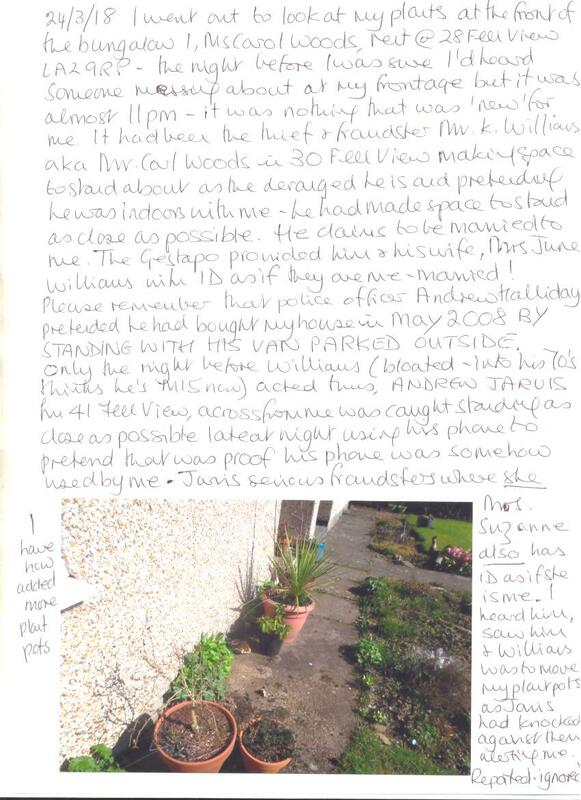 See the photo attached of 24 March 2018 and after I mentioned Jarvis, Mr K WILLIAMS aka MR CARL WOODS in 30 Fell View sneaked out late at night and moved my plant pots so that thieves and worse could get right by my window without being heard. Jarvis had kicked my pots on 22nd which alerted me to someone right outside. I reported him for trespass, harassment and more which is why the Gestapo contacted WILLIAMS aka WOODS to aid and abet for another attempt. I am Carol Woods Ms 28 Fell View LA2 9RP sorry I have no phone. 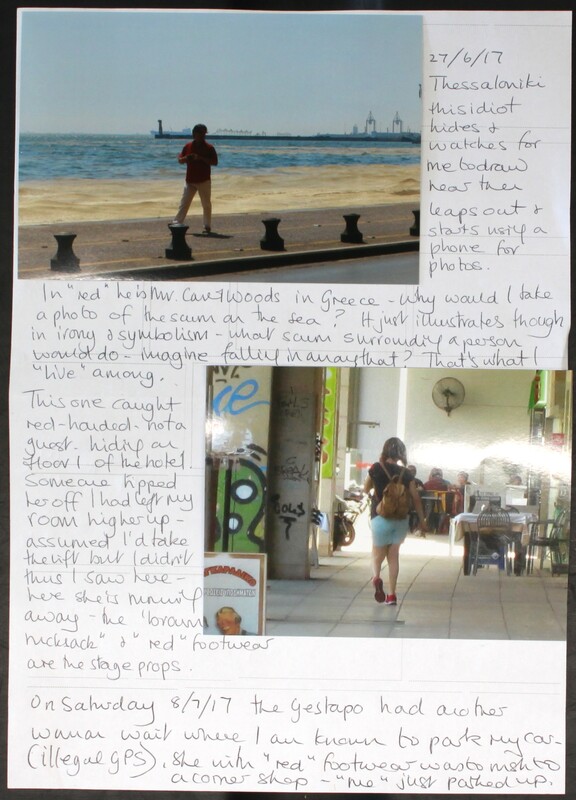 I also add the same use of idiots with phones from June into July 2017 when I was in Thessaloniki with the male leaping out to take a photo of nothing and the female found hiding at least 3 times outside my room door in the hotel she using her phone; here she runs away as she knows she is found out. Apparently I have made up the FACT that I was in Thessaloniki in June and July 2017. PS I copy this to a relatively new firm in Lancaster ATLAS, which thugs and vans I found constantly stalking me after hiding in Caton and following me to the town. I had no idea who they were but knew they were to be ATLAS REMOVALS of Morecambe thieves and worse who LOOTED MY HOUSE with COUNCIL on 19 Nov 2008 and need to be covered for. I checked the vans on the Internet and found they were a Blackpool firm with NHS LINKS. I alerted the firm sent them other events of stalking to harass and offered photographic evidence if their drivers said they were not hiding in country lanes to stalk me. (I see them, pull in and they have to pass so I get their plates) and today AGAIN one hiding in Caton as a “back-up” to the sleazy hiding in 33 Fell View, 20, and 30 at least who are all pretending to be driving me about. Thus this goes to that ATLAS firm again. This is a snap shot only and to Mr HUNT as the continued use of NHS money WILL be reckoned with. to huntj, heather.tierne., bae146, me, brian, editor, editor, policing.minis., hq-professiona., richard.little., mirrornews, coopery, bob.gallacher, lepforum, ministers, david.gauke.mp, secofstate, andyssecureema. More from NHS of Nov 2015 wrongful arrest and false imprisonment, illegal detention and NOW trying to "revise" this and make it NOW. 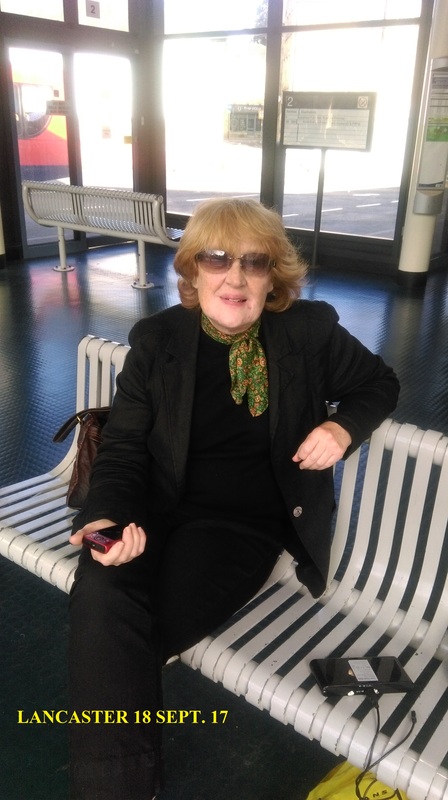 This from Ms Carol Woods subject of police hounding of YEARS and in that as the "crimes" I am arrested for committing are non-existent they use the "arrest" with corrupt NHS who then claim I am mentally ill so there is never a chance of a jury seeing FACTS. This is ONE arrest of me, some from the same date (I was arrested on 7 Nov 2015 for committing at least 20 "crimes" with not one page of evidence in the lunatic "crimes". The NHS in my VAST experience are corrupt beyond belief. The same was tried AGAIN on 31 Jan 2018 when I was arrested for being a male from Bournemouth and posting on his web site which postings were criminal! The pages with this are 2 more from the NHS LIBEL and utter drivel compiled within the above travesty. These were more liars from the NHS who had never even spoken to me yet felt able to compile their pages of utter nonsense. They invented FACTS from events that had been used in the Masonic inversion of lunacy with perjury as standard, ignored and blatantly used as routine. The documents were to be presented before a tribunal and somehow, they think that that is not perjury when the Perjury Act 1911 clearly records "tribunals" as among those false documents are placed in front of. The INTENT and CONSPIRACY is the usual within perjury. Sec 5 of the Act is relevant. 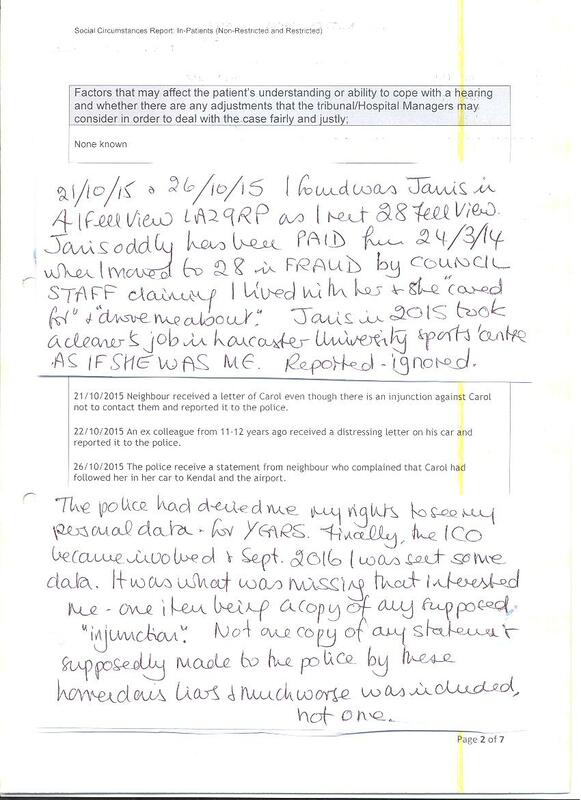 21/10/15 "injunction" said to exist, Jarvis in 41 Fell View LA2 9RP ANOTHER who claims to be me in 28 Fell View (apparently ALL those who claim to be me are sane and normal) is a liar, there was no such injunction and of course the Gestapo could not produce one: I was to be so befuddled with drugs ILLEGALLY ADMINISTERED I was expected to believe anything at all. 22/10/15 they refer to an "ex colleague" of mine, which was odd as I was arrested for a list of "crimes" then told I was mentally ill as I only said I'd had the jobs I said I had had which warranted locking me up for 4 months. How then have I an "ex colleague"? (The drivel stated was lies anyway. He is DAVID JACKSON a stalker from 2012 using his mentally ill wife SUSAN as me for a LLOYDS bank fraud. He stalked and STILL does to pretend he seen where I am, is proof I am his wife!) He was used as he lives at 28 Regent St Lancaster and the 28 Fell View where I rent was to be confused with that. 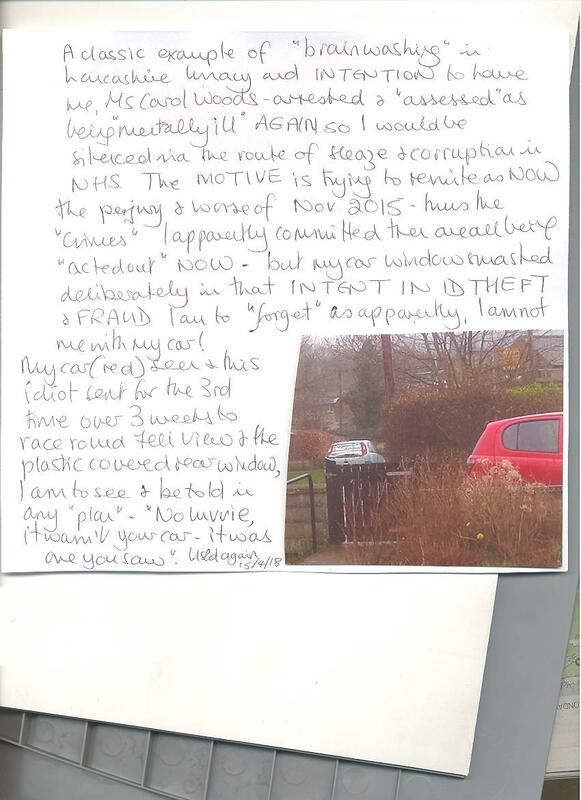 26/10/15 and "follow to Kendal" this was Jarvis who I guarantee had never been and is a known thief, liar and fraudster at best. Since then the Gestapo using her have had her sitting in her car GN07 AHO waiting for me to set off from 28 Fell View where she races ahead of me and screams I follow her. On 9/4/18 they used others in that same tedious routine who are more to make ludicrous claims and more unemployed lowlife used. It took me months to find it was Jarvis that made those false claims. Remember that the police altered the custody records of 7 Nov 2015: I have both copies. 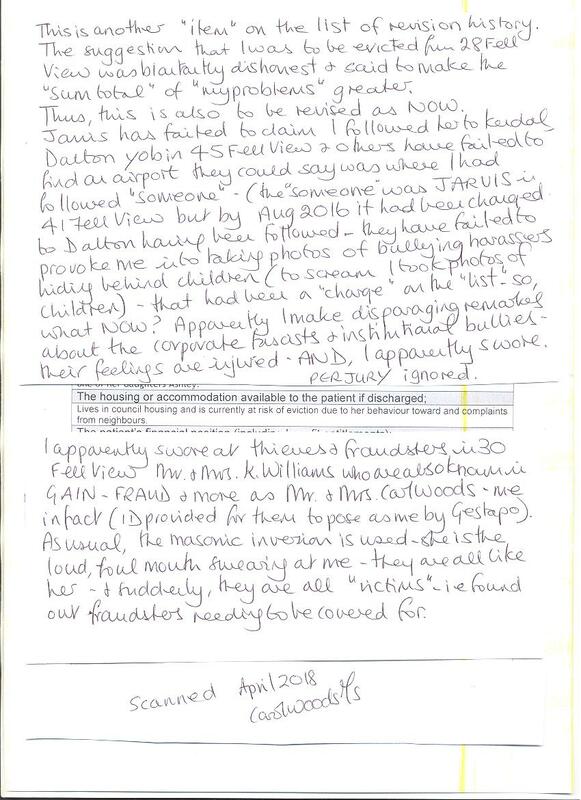 On yet another arrest in lunacy 31 Jan 2018 where they tried to link me to thieves and fraudsters and worse in 45 Fell View DALTON, unemployed yob and his unemployed mother, (all are life- long unemployed) I am STILL deprived of the custody record and of the tape I made. The NHS they drew in that day to hope they could rewrite this of Nov 2015 with BOGUS NHS, would not do what was wanted: thus the Gestapo continue to invent "crime", manufacture, use unemployed lowlife mostly and have them jump through hoops to catch me out. Carol Woods Ms 28 Fell View LA2 9RP sorry I have no phone. Please note the "following" frauds have been attempted in manufacturing others from Fell View to sit and wait, drive off behind me then overtake me and scream they see me following them such as ROWBOTTOM (again) yesterday in S77 VAT car (unemployed, she has 2 cars the other is Seat, PO11 XTL and she uses that also in exactly the same harassment of me). A jury would be expected to believe that I sit in my little car outside 28 Fell View and with a tank full of petrol wait for someone to drive off (all unemployed they all have at least 2 cars and all better than mine) and then follow them hoping that I have enough petrol to travel wherever they are going. How did they decide that I was "ill" when arrested in Jan this year? The sleazy "Lisa" NHS claimed it was because I said I waited to be interviewed. Please feel free to quote me. The question has been asked: “why would the “Powers That Be” target someone such as Carol Woods for so long [since 2001], involving so many perpetrators, committing so many serious crimes, funded by the public and local council taxpayers?”. This is now my report as to serious E Crime and more. The thuggery and harassment TODAY in the pathetic manufacturing of CRIME said to be committed by me of "following" (unemployed criminals who want to be victims) is seen. This was yesterday: DE61 DBO I have reported as stalker and harasser for months he using 45 Fell View (Dalton the thieves and fraudster you like to claim are "witnesses" to "crime" and not criminals) and 34 Fell view more thieves and fraudsters as reported. Blenkinship. I have copied and sent out the photos showing the ILLEGALLY INSTALLED WIRING dangerously installed in 28 Fell View ready for my moving in and related photos so do not resend them with this. I sent photos of the yob with DE61 DBO and his troll stalking ME on 17/2/18 with the INTENTION of claiming they drove me. In that DALTON and others were used when it was thought I was going to a travel agent (illegally seen emails) and DE61 DBO was to collect Dalton from 45 she with a PINK BAG and they to PRETEND she was me at the travel agent if I went. I had not gone; I ask if she would travel on my passport? Earlier in the week, you had JARVIS every morning go to be ME which wasted her time and then Williams in 30 went at least two afternoons as she was to be me seen there when i had not gone at all. The pink bag farce we have flogged to death; the old unemployed for life thief Dalton has no daughter and the pink bag she has is nothing I would have and nothing one of my daughters would buy me. Collecting Mrs M DALTON aka WHEATFIELD was done on 10 March 2018. In that you thought I was really going to go to Turkey and sent LINDA FOSTER who I had not seen for over 12 years "bump into me" she knowing which shop I happened to be in, and she was to tell me she was going to Turkey at the end of the month to be me when YOU thought I was to travel. I saw Linda Foster while she was apparently in Turkey! In that you have not made a decent person into a liar, she is a compulsive liar and deluded but harmless and not unpleasant. On SUNDAY (yesterday) in fact, all the collective efforts to rewrite 7/11/15 failed thus the yob and others collected at 34 and 45 yet again and the loft noises went on for hours. The INTENT is to manufacture junk that I engage in social media drivel. Allow me to explain the "signals" you rely on. If I take a phone which I have not got or a computer which I had but now have not, to somewhere with WiFi then the "signals" emanate from that source, BUT when I walked away with my computer the record of USE WAS ON THE COMPUTER. the signals was NO proof the equipment was mine just because I was in that place. Thus the lowlife who use the ILLEGAL devices in MY loft can pretend the SIGNALS are from me in 28 but the evidence OF USE is on their equipment which is not mine is it? And their equipment is where they are; it is not with me. Even a 6 year old would understand that. I quote the COMPUTER MISUSE ACT 1990 which is the LAW even for you: A person is guilty of an offence if a) he causes a computer to perform any function with intent to secure access to any program or date held in any computer, 2) the access he intends to secure is unauthorised, 3) he knows at the time when he causes the computer to perform the function that that is the case" etc. I refer also to T DALTON and yobs at 45 accessing MY email addresses and FOUND OUT with your Gestapo visiting them in the early hours to aid and abet. This is cc to anyone I feel should know: PUBLIC INTEREST and I will print it off and keep it with me. I will add that the troll with RATCLIFFE and BIBBY estate agent hiding in a house for sale in Caton pretending to deal with the house for sale and linked to me was not, the white BMW with the old doxy driver hiding who then raced north on the M6, M60 MKE and the 2 corrupt solicitors trying to be where I was as proof of something in masonic lunacy does not make NOW be 2009 again. Sending IAN READER Sunnyside Lane Lancaster LA1 5ED perjurer from 2009 to keep "bumping into me" does not make me think then is now. Perjury has no statute of limitations, he, as an educated man, should know that. Carol Woods ms under duress at 28 Fell View LA2 9RP.